SiteGround vs WP Engine - Which Offers the Best WordPress Hosting? If you’re looking for hosting for your WordPress website, two names you’re bound to have come across are WP Engine and SiteGround. Both companies offer WordPress-focused hosting services, but which is best? In Today’s comparison, we’ll be exploring the features on offer, what you get for your money, and which service delivers the fastest loading times. Since launching in 2010, WP Engine has become one of the main players in the premium managed WordPress hosting space, and has garnered a reputation as a specialist in this area. 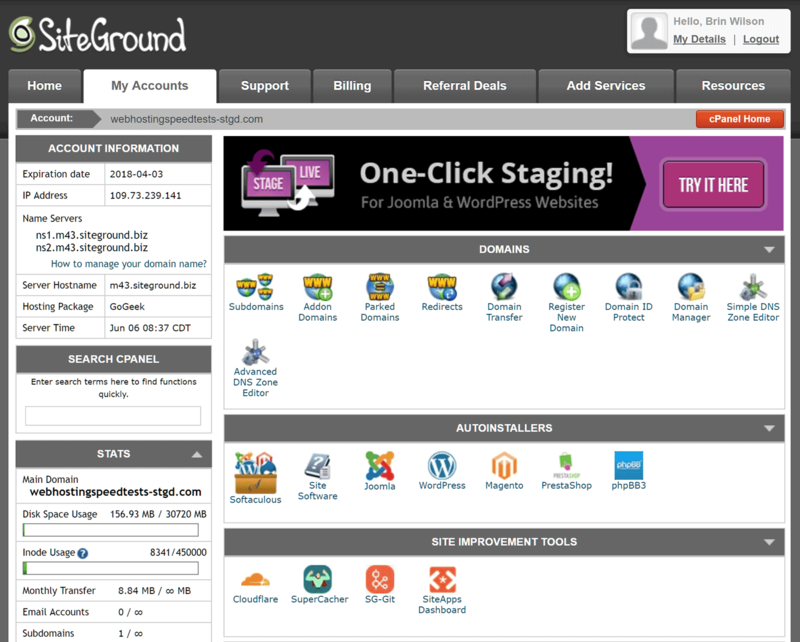 SiteGround has been offering general-purpose hosting packages since its launch in 2004, later adding managed WordPress hosting to its lineup. WP Engine offers three main WordPress shared hosting plans, with two additional higher-performance options. SiteGround also has three main shared hosting plans, as well as higher-end dedicated server options and enterprise hosting. For this comparison, we’ll be focusing on the GoGeek top-tier shared hosting plan from SiteGround and the shared hosting entry-level Personal plan from WP Engine. These two plans have similar prices, although (as we’ll see in the pricing section of this comparison) the former currently offers significant savings for those paying annually. WP Engine Personal and SiteGround GoGeek plans are good choices for WordPress users because the servers are optimized for WordPress software, and also come with WordPress pre-installed for an easy website launch. Number of WordPress installs allowed — WP Engine: one; SiteGround: unlimited websites. Supported visitors per month — WP Engine: 25,000 (maximum); SiteGround: 100,000 (recommended). Web space — WP Engine: 10GB; SiteGround: 30GB. Data transfer — WP Engine: unmetered; SiteGround: unmetered. We’ll look at pricing in more detail in the next section, however the main differences are that SiteGround will let you host an unlimited number of websites on your GoGeek account, while the WP Engine Personal plan is limited to just one live site (plus a staging site). In addition, WP Engine covers a set number of visitors to your site, while SiteGround does not, only stating the number of visitors the plan is suitable for. If you exceed the limit with WP Engine, you can expect to pay overage charges, rather than having access to your website restricted. Although there are no usage caps with the SiteGround GoGeek plan, if it looks as though your website may suffer from performance issues as a result of increased visitor numbers or activity, the support team will contact you to discuss your options. WP Engine Personal Plan: $29 a month (two months free if paid annually). SiteGround GoGeek: $29.95 a month (reduced to the equivalent of $11.95 a month if paid annually). The usage details and pricing information for WP Engine shared hosting plans. The $29-a-month Personal plan from WP Engine is the entry-level plan, while GoGeek is the top-tier shared hosting plan from SiteGround. 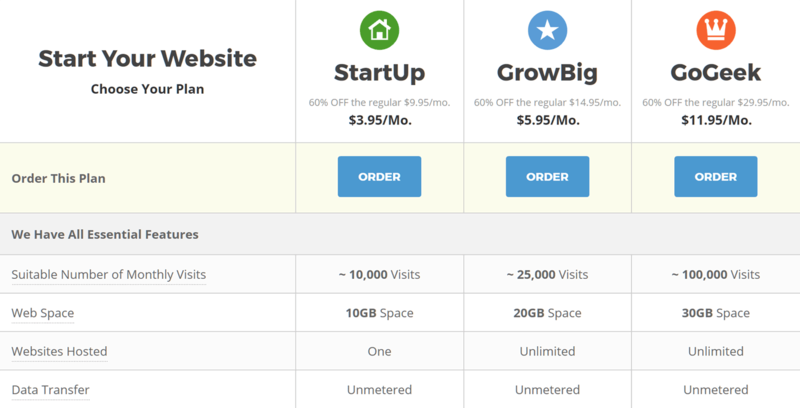 The usage details and pricing information for the SiteGround shared hosting plans. When it comes to money-back-guarantees, SiteGround gives you 30 days, while WP Engine gives you 60 days to apply for a full refund. Now we’ve covered the pricing and key details of the plans, let’s explore what kind of service SiteGround and WP Engine offer. Although there are some excellent WordPress backup plugins out there (such as VaultPress), letting your web host take care of site backups can give you peace of mind. Both the SiteGround GoGeek and WP Engine Personal plans include automatic daily backups of your site, as well as the ability to create manual backups yourself. Customers can restore backups through their hosting account control panels, or request that the support staff carry out a restoration. The only way to contact the WP Engine support team for those on the entry level Personal plan is through the 24/7 live chat channel. All of the WP Engine hosting plans apart from the Personal plan offer 24/7 phone support, while ticket support is reserved for the top tier Enterprise plan. SiteGround customers on the GoGeek plan get access to 24/7 phone, live chat, and ticket support. SiteGround GoGeek customers can contact the 24/7 helpdesk via phone, live chat, and the ticketing system. Support requests from GoGeek (and the lower GrowBig plan) customers are given priority status over requests from customers on the entry level StartUp plan. Creating a staging version of your site gives you a safe space to carry out testing and development work before applying the changes to your live site. Both the WP Engine Personal and SiteGround GoGeek plans give you the ability to create a copy of your site in a protected staging environment. Creating a staging site with WP Engine is incredibly straightforward, with the controls located inside your WordPress admin area. With SiteGround, the process is almost as easy, but takes place through your external cPanel dashboard (more on that later). If you already have a WordPress website, moving it to WP Engine or SiteGround isn’t a problem. SiteGround offers one free site migration for new customers with no expected downtime and a turnaround time of a few hours. 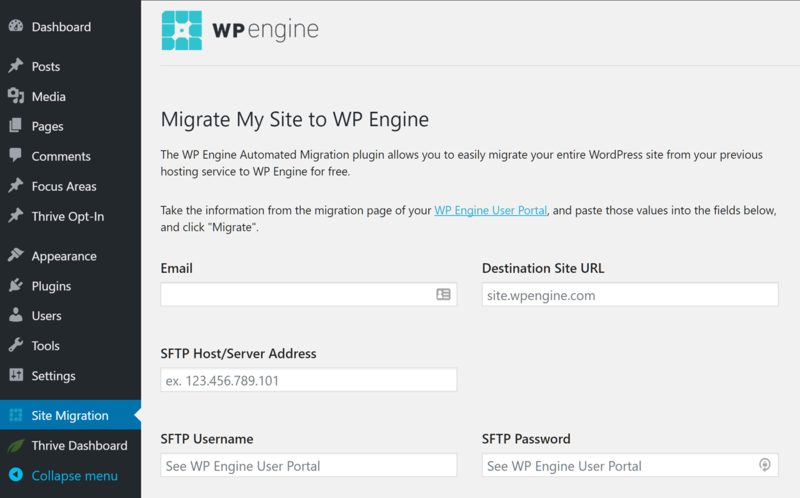 The WP Engine Automated Migration plugin will help move your WordPress site to WP Engine’s hosting service. 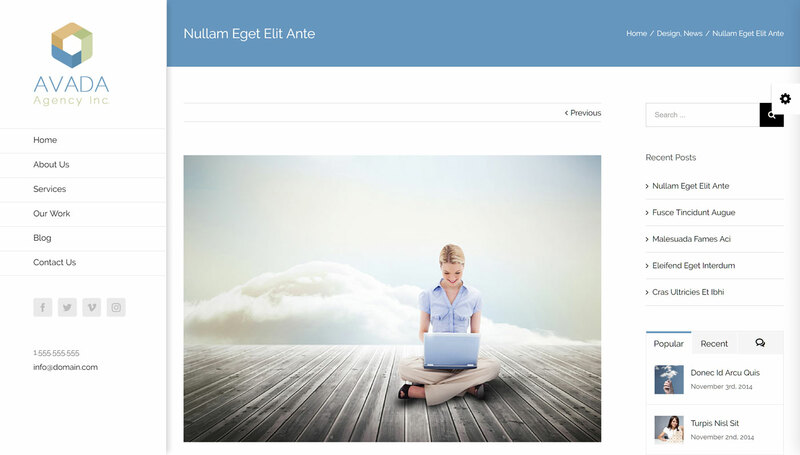 WP Engine has a free plugin that will facilitate the migration of a WordPress website from another host to its servers. If you run into any problems during the migration, you can contact support. Both WP Engine and SiteGround give you options when it comes to where your website is hosted. WP Engine has data centers in the United States, Canada, United Kingdom, Belgium, Ireland, Taiwan and Tokyo. However, your options vary depending on which plan you choose, with the Personal plan only covering the United States, United Kingdom, Belgium and Taiwan. When creating a GoGeek hosting account, you can choose from SiteGround data centers in the United States, United Kingdom, Netherlands, Singapore and Italy. An improved loading time is one of the main reasons to choose a managed WordPress host over generic shared hosting. Often, the benefits of a faster website can help justify the extra cost. But which web host is faster: WP Engine or SiteGround? The multipurpose Avada theme and one of its feature-packed demo pages was used for the speed tests. 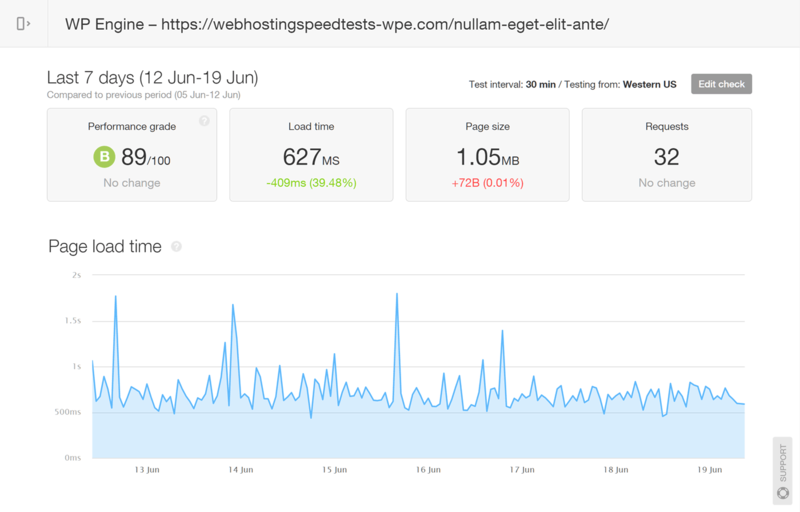 The WP Engine vs SiteGround page speed results from seven days of testing with Pingdom. As the data was being gathered, we contacted the SiteGround support desk to see if they had any advice on speeding up the test website. Based on their advice and the online documentation, gZIP compression and browser caching were enabled. Caching was enabled for both WP Engine and SiteGround websites — as were any other performance-enhancing techniques that made up their services (more on those later). For both services, the Pingdom testing location nearest the data center where the website was hosted was chosen. The page load times that were recorded for the WordPress website hosted by WP Engine. The page load times that were recorded for the WordPress website hosted by SiteGround. The demo content from a feature-packed multipurpose theme was used for the testing, so it may be possible to get better results from using a more lightweight theme with content optimized for improved performance, or by experimenting with the other ways you can make WordPress faster. So, with both services having good uptime scores, let’s go over the finer points of the SiteGround and WP Engine WordPress hosting plans to help you decide which one’s best for you. 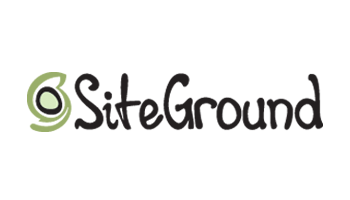 With SiteGround, you can access the web server and its files through the online file manager. Website caching: WP Engine has a proprietary caching system called EverCache, while SiteGround has its own SuperCacher technology. Content delivery network (CDN) service: SiteGround includes free CloudFlare CDN access, while WP Engine offers CDN access for an additional $19.95 a month. PHP: SiteGround offers a choice of versions including 5.3 and 7.1, while with WP Engine you can choose between PHP 5.6 and 7.1. WP Engine also offers a free compatibility checker plugin. HTTP/2.0: both WP Engine and SiteGround use HTTP/2.0. SSL: both WP Engine and SiteGround offer free Let’s Encrypt SSL certificates and support other options. SFTP: both WP Engine and SiteGround offer SFTP access on all plans. Server file manager: SiteGround offers web server access through an online file manager, while WP Engine does not. Database access: both SiteGround and WP Engine offer access via phpMyAdmin. Email service: SiteGround offers a full email service, while WP Engine doesn’t offer email services. WordPress website management: both services will keep your WordPress website software up to date. Plugin restrictions: SiteGround allows all WordPress plugins, while WP Engine has a list of disallowed plugins. Security measures: both SiteGround and WP Engine carry out malware and DDoS scanning checks on your website, with WP Engine also limiting login attempts and more. Post-hack cleanup services: SiteGround doesn’t offer any hack or infection cleanup services, while WP Engine will provide assistance to fix your site if it’s hacked on its hosting. Now that you have a good understanding of WP Engine and SiteGround’s main similarities and differences, let’s explore the user experience of each web host. With both WP Engine and SiteGround, account and website management takes place through their online dashboards. The WP Engine account dashboard. The custom WP Engine dashboard makes it easy to see how much storage you’re using and how many visitors to your site have been logged. These two figures can affect how you’re billed, so it’s good to be able to check them at a glance. You can also view how much bandwidth your site is consuming. Backups can be created, downloaded, and restored from within your WP Engine dashboard. As mentioned, with WP Engine, your website will be automatically backed up on a regular schedule and before WordPress software updates are installed. 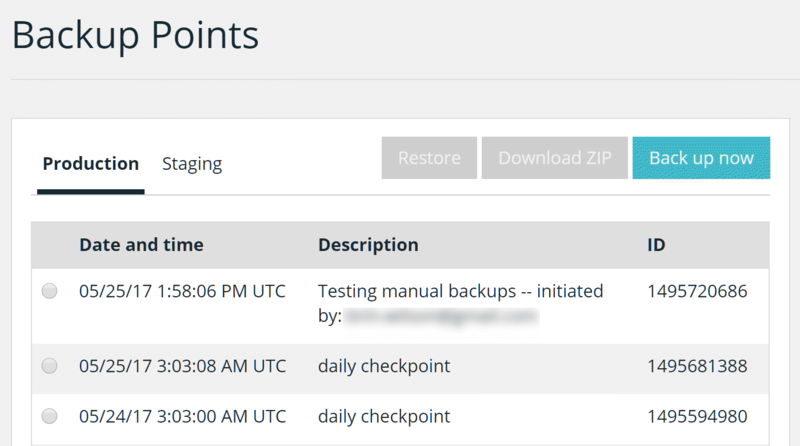 However, you can also manually create a backup at any point through your WP Engine account dashboard. As it’s a good idea to back up your site whenever you make changes, it’s nice to see it only takes a click to create a backup with WP Engine. Restoring a backup is just as straightforward. 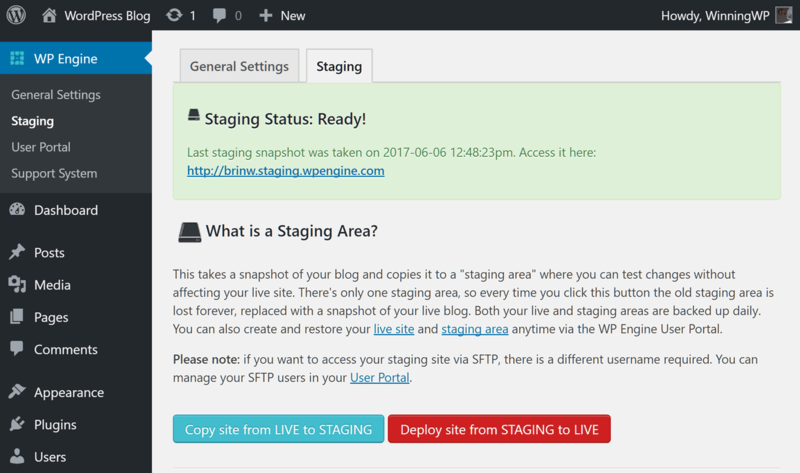 Create a staging version of your website through the WP Engine section of your WordPress dashboard. Websites hosted by WP Engine also have an optional extra set of controls in their WordPress dashboards. Through these controls, you can find the cache settings, the ability to create a staging environment for your website, and links to your account dashboard on the WP Engine website and the support portal. WP Engine gives you the ability to test the performance of specific pages on your website. Back at your account area on the WP Engine site, there’s a page-level performance testing tool. By entering the URL of a page on your site, you can produce a report outlining how well that page performs, along with recommendations for improvements. WP Engine support staff can be contacted through the live chat feature of the dashboard. the ability to manage the billing details for your account. 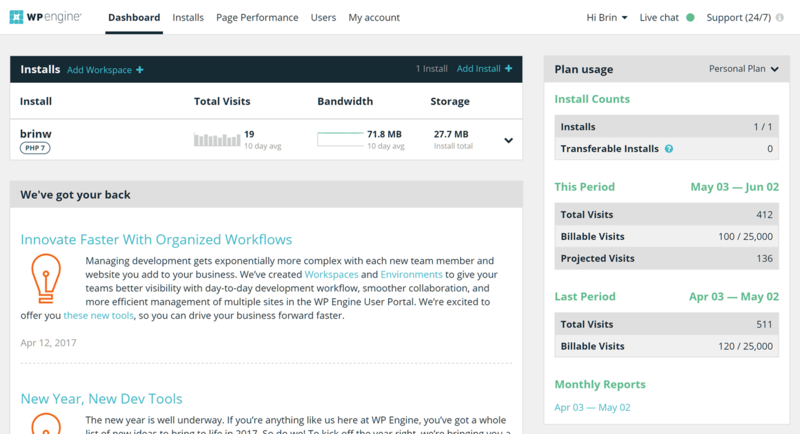 The WP Engine dashboard is well designed and easy to use. All the essentials are covered without anything extra that could potentially distract or confuse. Some of the tools and controls available through the SiteGround cPanel. 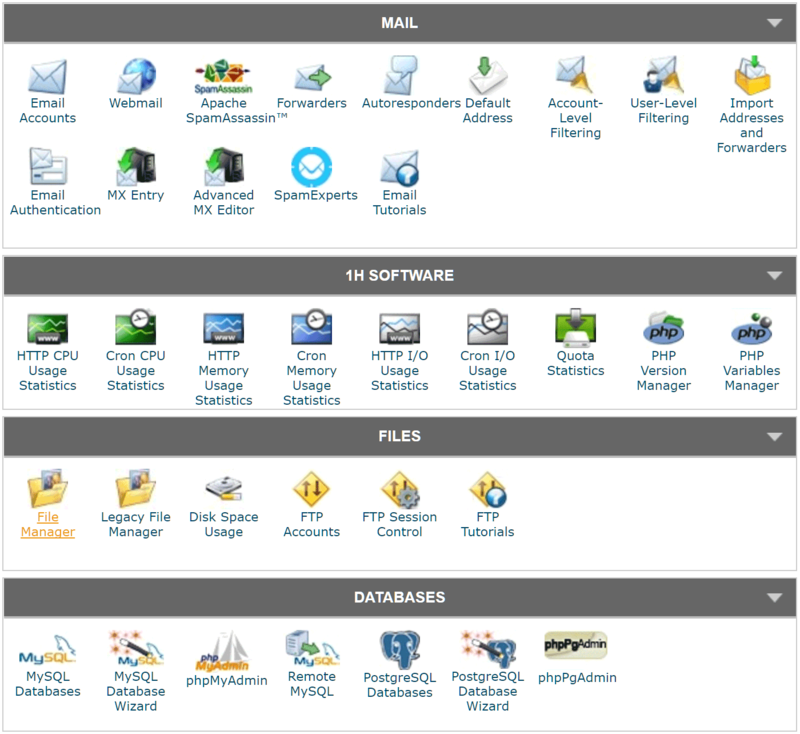 Unlike WP Engine and its custom control panel, SiteGround uses the popular cPanel software for its dashboard. SiteGround and cPanel do give you a lot of control over your web hosting account, but this can also be a bit overwhelming. While WP Engine is focused on hosting WordPress websites, the SiteGround service is more varied, and this is reflected in the control panel. SiteGround gives you more freedom and greater access to your account configuration, but this may be confusing for some users. Although you get a good amount of control over website backups with SiteGround, the user interface for managing them isn’t as slick as it is with WP Engine. 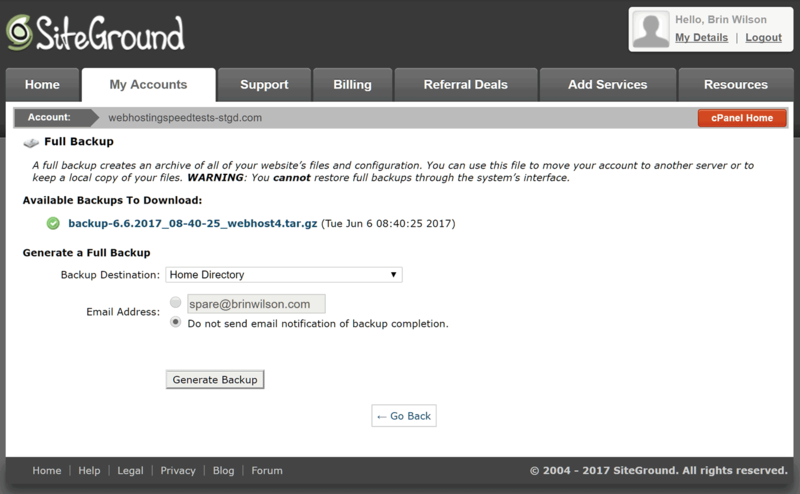 Website backups are created automatically with SiteGround, but you can also create and restore them yourself through the control panel. Like WP Engine, SiteGround adds a control panel to the WordPress dashboard of websites it hosts via its SG Optimizer plugin. Through the SG Optimizer section of your WordPress dashboard, you can enable caching, force HTTPS, and change the PHP version. 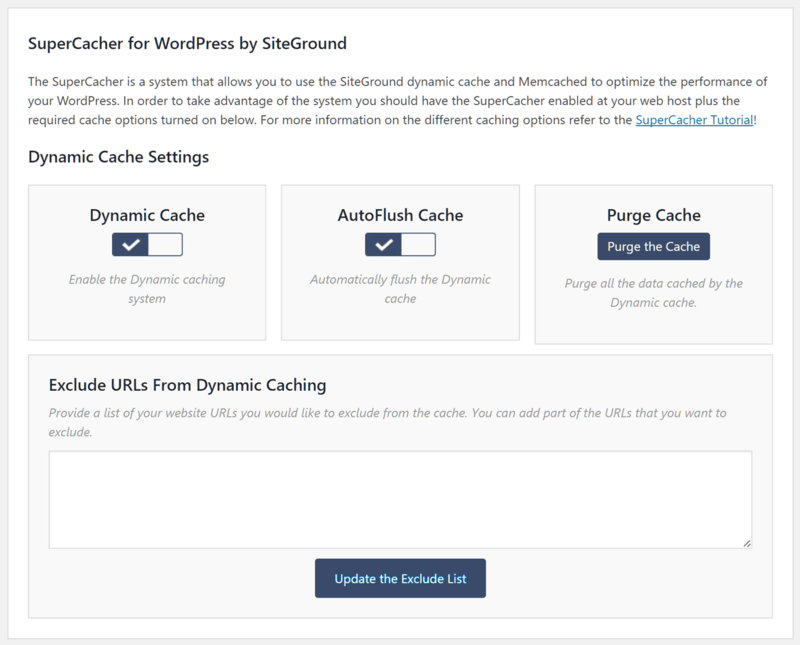 The SiteGround SuperCacher tool can be configured from within your WordPress dashboard. Although you can do much more through the SiteGround control panel, such as manage multiple websites, install additional software (such as Joomla) on your web space using Softaculous, or access the files on your server, the interface isn’t as user-friendly and intuitive as WP Engine’s dashboard. The WP Engine Personal plan was able to deliver faster loading times compared with the SiteGround GoGeek plan in our tests. However, if you take advantage of its current annual payment discount, the SiteGround GoGeek plan is a lot cheaper than its rival. Other points to consider include the fact that the SiteGround GoGeek plan allows you to host multiple websites on different domains, while the WP Engine Personal plan supports just one WordPress website plus a staging site. The SiteGround GoGeek plan also lets you create other types of websites besides WordPress sites, includes an email service, and provides access to your server space through a graphical user interface. You can also contact the SiteGround support team via email and telephone, while with WP Engine these extras aren’t included. However, WP Engine does offer a more straightforward user experience. If price is your main consideration, the SiteGround GoGeek plan and its annual payment discount is very appealing. However, if you value performance and simplicity, prefer to use a service with a single focus, and don’t mind forgoing telephone support, then the WP Engine Personal plan is the better option. Used/using either of these two hosts? Thoughts on each? 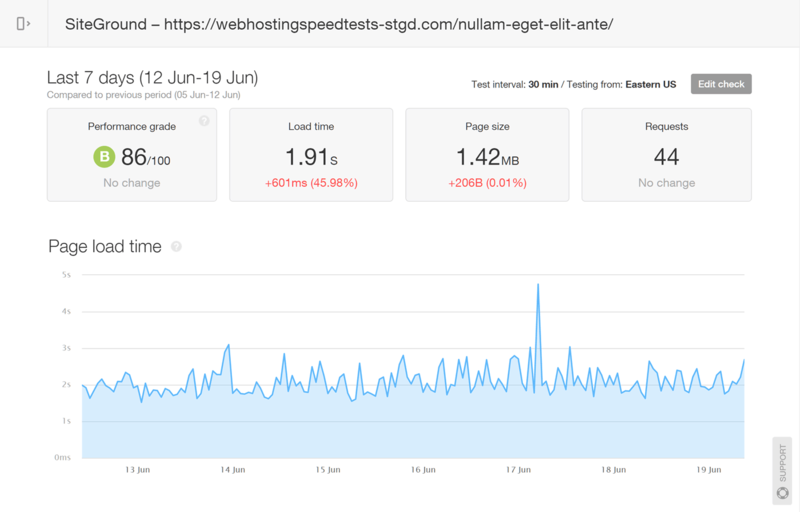 Regarding the loading times on Pingdom – the SiteGround test comes out slower, but it’s doing 44 requests – 12 more than the 32 requests the test site on WPengine is doing. This can’t be relied on to conclusively show which is faster. Why the inconsistency? The sites were set up to be same so I would assume this is down to the way the hosts cache them.